KHOST CITY, Afghanistan, August 28, 2013 (ENS) – Once-green mountainsides across Afghanistan are still being stripped of their trees as the long-running process of deforestation continues. The head of the agriculture department for Khost province in eastern Afghanistan, Dr. Naqibullah, says that about half of the 1,300 square-kilometre area that was once covered in forests has been cleared over the last three decades. This reporter visited Qalandar district, in the northern part of Khost, where loggers were hard at work with axes and chainsaws. They have parceled out sections among themselves, and are steadily turning green woodland into arid desert. Local people say they have no option but to cut down the forests, as they possess neither farmland nor any other means of earning an income. Local government officials in Khost say they have taken some action and have at least managed to slow the pace of deforestation. Provincial police chief Abdul Qayoum Baqizoi denies allegations that his force has turned a blind eye to illegal logging. As far back as December 2011, the “Pajhwok Afghan News” quoted an official of the Environment Protection Agency, Mohammad Ali, saying that deforestation would have a negative impact on environment of Khost such as devastation caused by recent floods. Ali said residents of remote areas should be convinced to plant trees instead of cutting them. As long as the government did not provide job opportunities for residents, the deforestation problem would persist, he acknowledged. In July, the United Nations Environment Programme issued a guidance chart on natural resource management and peacebuilding in Afghanistan showing that forest products, such as firewood, construction materials, animal fodder and tree crops, contribute to the livelihoods of millions of Afghans. Forests reduce the risk of soil erosion, landslides and desertification. UNEP said the forestry industry in the eastern part of Afghanistan, where Khost is located, and in plantation projects in other areas, if managed accountably and sustainably, has the potential to generate much needed revenue for the government and jobs for local people. UNEP confirms that over the past 30 years deforestation caused by increased demand for timber and firewood, and conflict have led to steep drops in forest cover. “Meanwhile,” the UNEP guidance states, “a lucrative industry has developed smuggling high value hardwoods to Pakistan.” Khost province shares a 196-kilometer (120 mile) long border with the Kurram tribal agency of Pakistan. 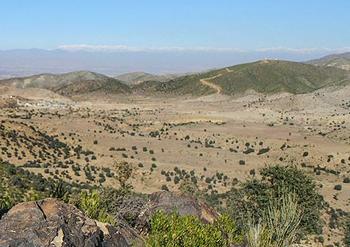 In UNEP’s view as expressed by the July guidance, Afghanistan’s forest sector faces two separate challenges. First, there is the challenge of reducing deforestation and competition for firewood. This can take the form of increasing supply by planting woodlots and involving communities more closely in the management of their local forests. Promoting alternative fuel sources and efficient cook stoves can reduce demand for fuel-wood. Then, UNEP suggests that “comprehensive approaches” be implemented to reduce trade in Afghan conflict timber.